The following post reveals details from the Season 6 premiere of Game of Thrones. So if you want experience the magic for yourself, come back and read this post later. We’ll wait on you, because we’re friendly like that. The rest of you, read on! Well that was something wasn’t? The pace of the Game of Thrones premiere was so quick and so much was thrown at you, it was hard to make sense of it all in one sitting. In lieu of a full on recap (Cindy will crank those up next week), let’s look at a handful of items that stepped out and will be popular topics of conversation at both the virtual and real water coolers. Jon Snow is dead. He’s not stunned. Or resting, kipping or pining for the fijords. Bereft of life, Jon Show rests in peace. If they hadn’t dropped him on that table, he’d be pushing up the daisies. This is a late crow. So with that bet settled, the next wager will be how many episodes before Jon’s back swinging Longclaw again? Game of Thrones can spend some production money but even they would think it would be wasteful to keep Kit Harrington as a third billed player in the credits to do a job a mannequin with a latex mask and a Slash wig could accomplish. Snow will be resurrected. 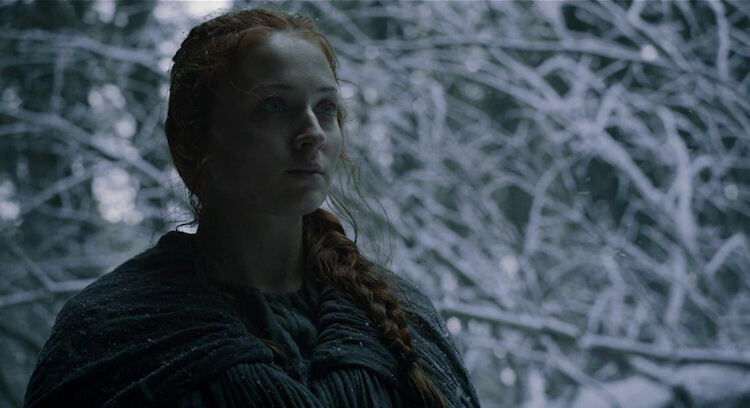 As has been discussed before, there are a lot of ways to not stay dead in the Seven Kingdoms and Ser Davos and the breakaway brothers of the Night’s Watch do have a priestess of the Lord of Light in their camp and a bunch of Wildings who owe them a favor. So I’ll set the betting line at Episode 3 when Jon Snow breathes again. The first of many WTF moments of the night belong to Sansa and Theon. In the extra-long “Previously on” segment, we saw the pair take a leap of faith a multi-story battlement at Winterfell. The next time they are shown, they are running for their lives through the woods none the worse for wear. No sprained ankles. No sore butts. Not so much as a scratch. There’s no explanation of how they survived. No snowbank, bushes or pillowsmith work area to break their fall. They are only winded because they’ve been running for so long. Thankfully, the writers don’t give us a ton of time to dwell on it, as Ramsay’s bloodhounds (who will be eating good tonight) close in fast. After a quick and dirty rescue from Brienne and Podrick, Sana rises and in the course of a single oath casts away the frightened child and becomes the boss Queen of the North she was destined to become. 3. Holy Sand Snakes, what’s going on in Dorne? And just when book readers thought the writers of Game of Thrones had run out of ways to aggravate them, the assassination of Doran by Ellaria Martell has thrown that whole plot line into chaos. I’ve not read the books, but enough people I follow on Twitter have. Evidently Dorne plays a much larger role in the books and a one point Doran has a memorable speech that everyone pretty much loves. If the Dornish plot line continues, those words will be coming out of someone else’s mouth. Just about every plot line in the episode featured a female character either exercising or gaining power – the happenings in Dorne were merely the most obvious. The developments in Dorne will be watched closely now and if they are dropped or ignored from here, expect it to be the season’s biggest target of fan outrage. 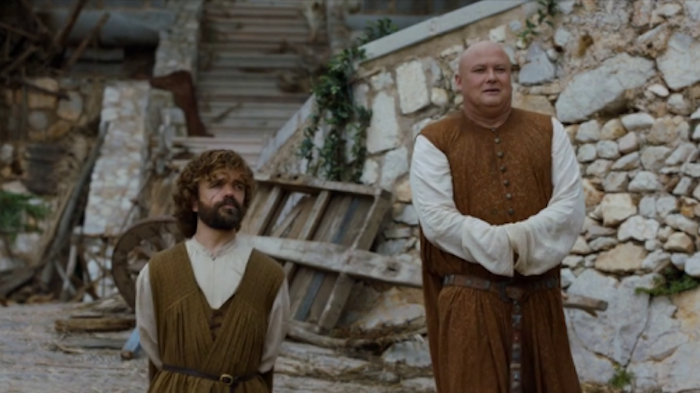 It’s always a joy to see Tyrion and Varys exchanging verbal jabs on screen, but you can’t help but feel concerned for the two of them as Meereen consumes itself. The city’s people are starving. The Sons of the Harpy were crippled during their attack on Dany in the arena, but they are far from dead. Dany, Jorah and Daario are in parts unknown, leaving the Imp and the Spider alone to run things. Now the harbor is burning, which means Tyrion is literally in deep with no paddle. After a few seasons of being an important, but yet still fringe character, Melisandre made the leap to major player in the last few minutes of the episode. The act of taking off that necklace transformed her from Lord of Light zealot who likes to get naked to someone or something else entirely. Without Stannis, her character seemed lost, without a place in the larger Game of Thrones story, but the transformation from beauty to crone gives Melisandre a history and depth not previously known. She’s gone from eye-rolling to interesting. You wonder how many times she’s tried to shape destiny in Westeros. It’s also important to not this was one of the few times we’ve seen magic performed that didn’t have roots in the lands north of The Wall. “The Red Woman” just scratched the surface of that is to come for this season of Game of Thrones, and one thing is for certain: there will be plenty to discuss in the weeks to come.